Former US Secretary of State Henry A. Kissinger was this year’s laureate of the World Jewish Congress Theodor Herzl Award. 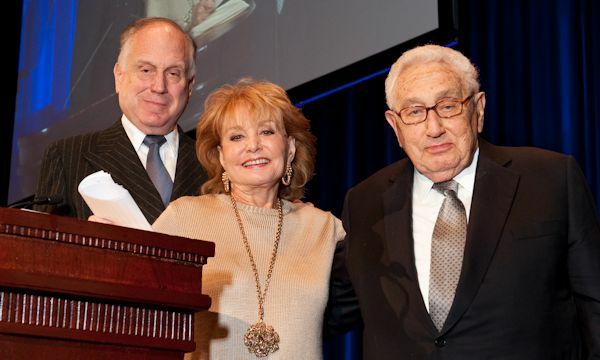 At the annual gala dinner in New York, the 91-year-old Kissinger was presented with the award by US journalist Barbara Walters. 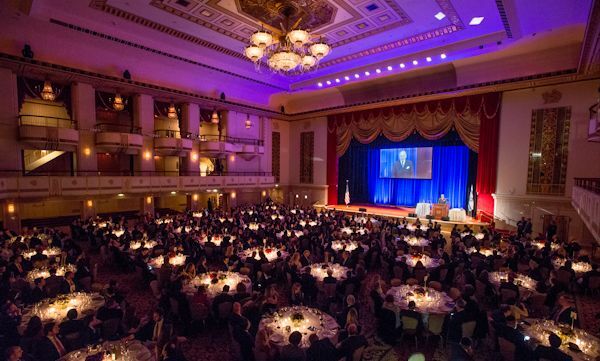 WJC President Ronald S. Lauder said in his address that “Henry Kissinger brought an unusual combination of knowledge, brilliance and skill to the office of Secretary of State.” More than 500 guests attended the dinner at Manhattan’s Waldorf Astoria Hotel. Introducing the laureate, Lauder particularly highlighted Kissinger’s efforts to secure peace in Vietnam and in the Middle East. He was instrumental in bringing Egyptian President Anwar Sadat to visit Jerusalem, the first step toward the Israeli-Egyptian peace treaty signed in 1979 at Camp David. The WJC president also said that German-born Kissinger had been America’s first-ever Jewish secretary of state. In his speech, Henry Kissinger addressed some of the challenges currently facing America and Israel: “There is enormous upheaval. We are in a period in which many of the institutions we’re familiar with are under attack. The Jewish people have again, in some countries, become the object of severe attacks. It is a moment in which the Middle East finds itself in upheaval in every respect… Israel is asked to pay an admission price before it is recognized and can participate in the international system. “In the years ahead, the US needs to keep in mind what it will defend, even if it has to do so alone; what it has to achieve together with allies, and finally, what is beyond its capacity. The survival of Israel and the maintenance of its capacity to build a future is a principle we will pursue, even if we have to do it alone,” Kissinger said. He added: “In the future, various groupings will form in the Middle East as countries emerge into a new definition of itself. The US has to learn how to position itself in a manner which will provide for the survival of Israel. America must be a central player and a decisive element on many of these issues. Theodor Herzl was the father of modern political Zionism. Born in Budapest in 1860, Herzl moved to Vienna and later to Paris. The anti-Semitic atmosphere he experienced there led him to believe that only the establishment of a Jewish state could bring about an end to Jew-hatred. In 1897, Herzl convened the First Zionist Congress in Basel, Switzerland. The World Jewish Congress Theodor Herzl Award recognizes individuals who carry forward Herzl’s ideals for a safer, more tolerant world through international support for Israel and enhanced understanding of Jewish history, culture and peoplehood. In 2013, Nobel Peace Prize laureate Elie Wiesel and his wife Marion received the Theodor Herzl Award, while in 2012 then Israeli President Shimon Peres was honored with the prize. The award was also posthumously bestowed on US President Ronald Reagan.